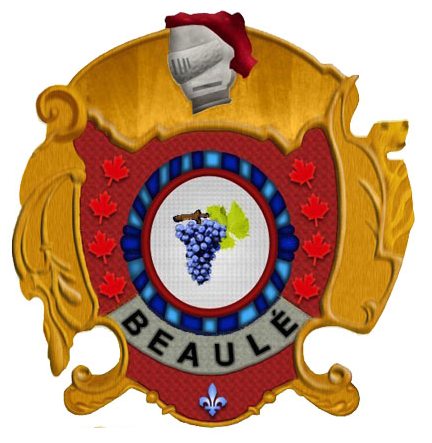 "THE BEAULE FAMILY ASSOCIATION OF AMERICA". This association, founded in 1990, is known under the name of: THE DESCENDANTS OF LAZARE BOLLEY INC. Its mission is to make known the story of our ancestor and the dispersion of his descendants throughout North America. In these pages, we wish to present to: the Bolley families of Europe, the Beaule families of America and their extended families, Lazare Bolley, this young soldier of the colonial troops who worked in Quebec from 1751 to 1759. He came to defend the colony of New France, which he did honorably, but during this same short period he also started a family. These pages will tell you about him, his ancestors in Burgundy, his career as a soldier "in Canada", his marriage to a canadian and the birth of a son in the summer of 1758. Unfortunately, he was not with his little family for very long, the war and military defeat deciding otherwise the following autumn. Next, these pages want to tell you the beautiful story of Lazare's young wife, now a single mother, who brings up her only son Jacques and the story of this son and his family after 1781. This family grows...and grows again...to form a long line of Beaule families. It's with pride, that we wish to tell you of the two centuries of history that followed. A history of courageous and hard working grandfathers and grandmothers that comes down to us. It's magnificent. The association has reached a great majority of the descendants and has invited them to many family reunions, with opportunities to socialize and rediscover one another. It has also done a great research project and compilied a list of descendants; its genealogical data base already contains more than 3000 names. This data base is linked to this site. It is a great tool for establishing your liniage and verify family links. It is all this, that this site of the association, wishes to proudly present to today's generation and for a long time to future generations. NB : In our "web" pages all underlined "words" or "group of words" are hyperlinks to other history pages. Please "click" on them.